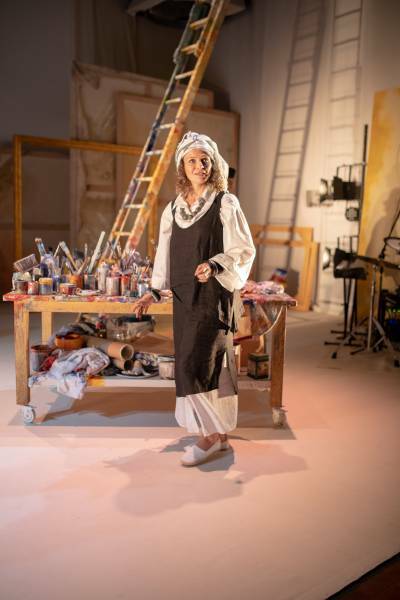 Perhaps it’s almost appropriate that the visual, dance and musical elements of a theatrical piece about a painter are stronger than the text-based performances. In this world premiere of a portrayal of Brett Whiteley and his muse, Wendy Whiteley, writer/ director/designer Kim Carpenter has depicted the painter’s artistic process with insight and verve. That process might be described as pouring hedonism and rampant creativity into a blender and switching it on with the lid off. Projections of Whiteley’s startlingly vibrant work – “optical ecstasy”, as he called it – are heavily featured, against a set of an unruly artist’s studio. Music, so important to the painter, provides a constant undercurrent of tension and commentary, thanks to composer Peter Kennard, who adds live drumming to his recorded score. Leeanna Walsman as Wendy Whiteley. Photo: Fabian Astore. This Theatre of Image production’s ultimate triumph, however, is Lucas Jervies’ choreography transforming such beloved Whiteley paintings as the famed “bathroom” series into three-dimensional, mobile life, via exceptional work from dancers Naomi Hibberd, Robbie Curtis, and Dean Elliott. While Tony Llewellyn-Jones is typically accomplished in playing Rees (and other minor roles), the rest of the cast struggles. The major problem is Gleeson’s Whiteley, which fails to convey the febrile charisma that bewitched so many contemporaries, and that found voice in the sheer energy of his art. Gleeson achieves glimpses of that compelling person, but lacks the consistency the role demands. Walsman is closer to a credible Wendy, without having excavated the character’s core truth, and Jeanette Cronin and Olivia Brown barely cast shadows as Brett’s sister and mother. Having expertly crafted this multimedia work, Carpenter has either miscast it or failed to extract the requisite performances. This is such a shame, given he could devise such glorious theatrical flourishes as having Whiteley park a toy car in front of a model of the motel where he died.